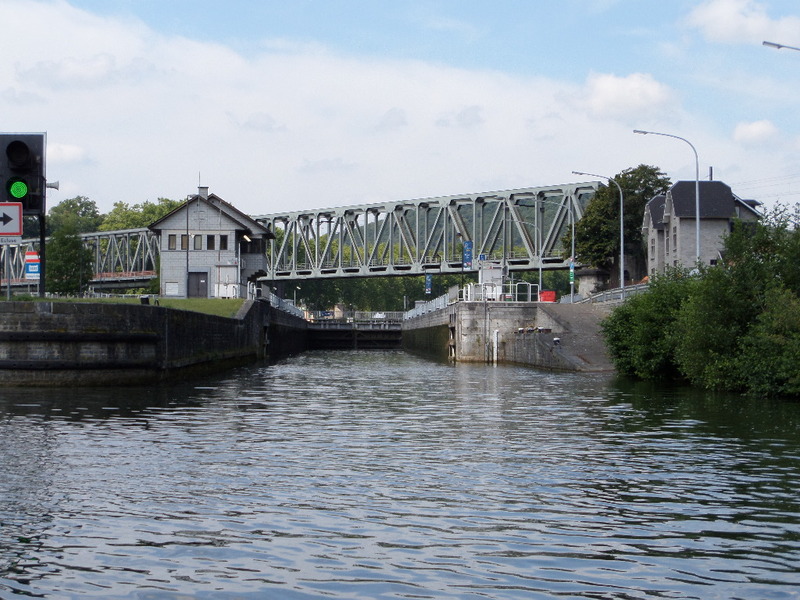 Yesterday we made it to Givet. Along the way I spied a cemetery. Now I love French cemeteries, they are far more interesting and beautiful than English ones. A beautiful waterfront welcomed us … lots of mooring and lots of restaurants/bars. Unfortunately the moorings are high so the poor dogs needed lifting up and down. 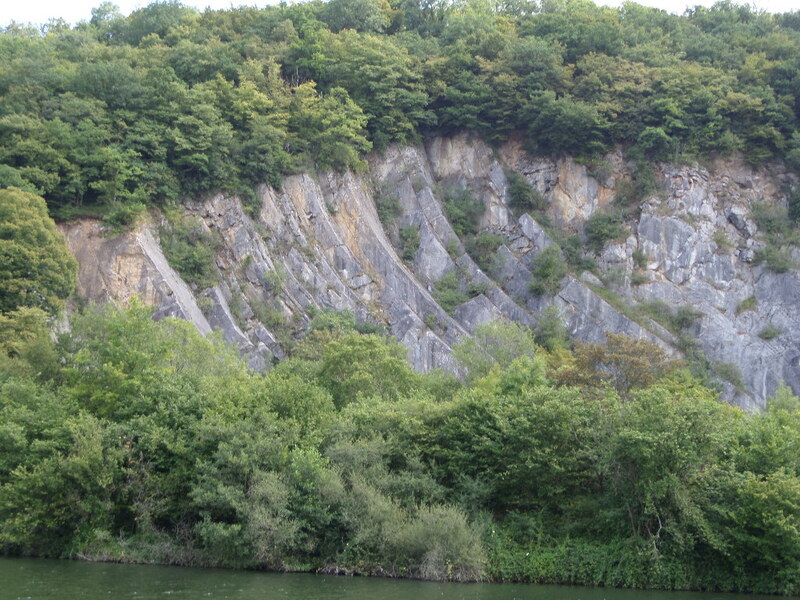 They soon got fed up with that so Kev devised a slope that they could climb up which they seem to prefer. 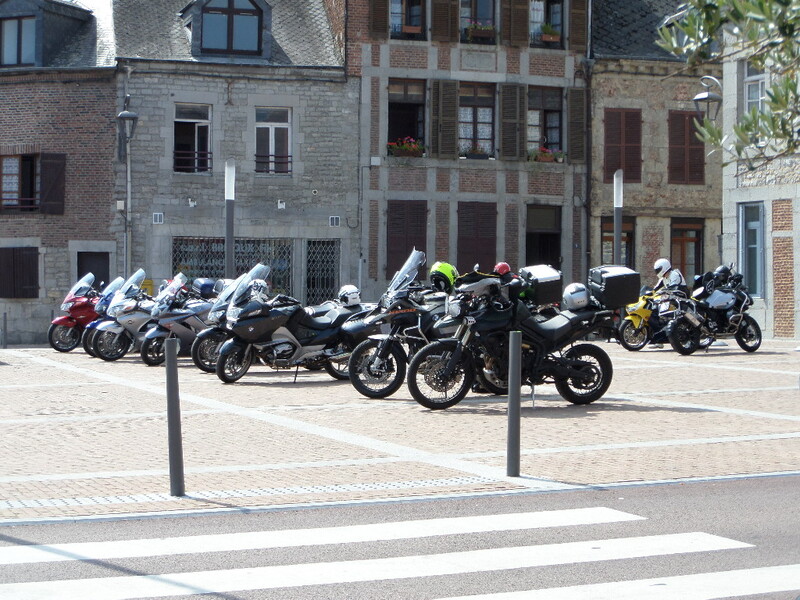 The bar nearby seems to be on a bike tour guide as all afternoon various bikers pulled up for a Perrier. We met a few characters while sitting in the sun downing a few. 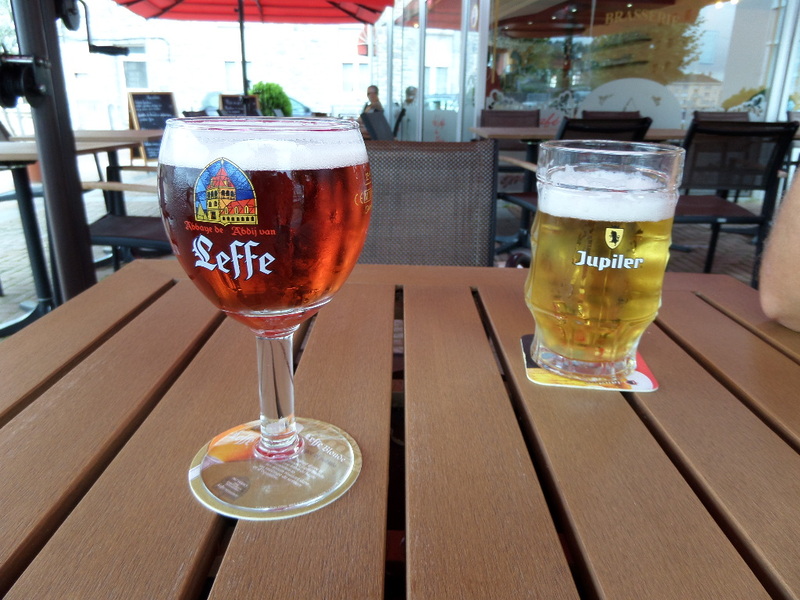 I discovered Leffe Ruby which is a lovely fruity lager (hic). 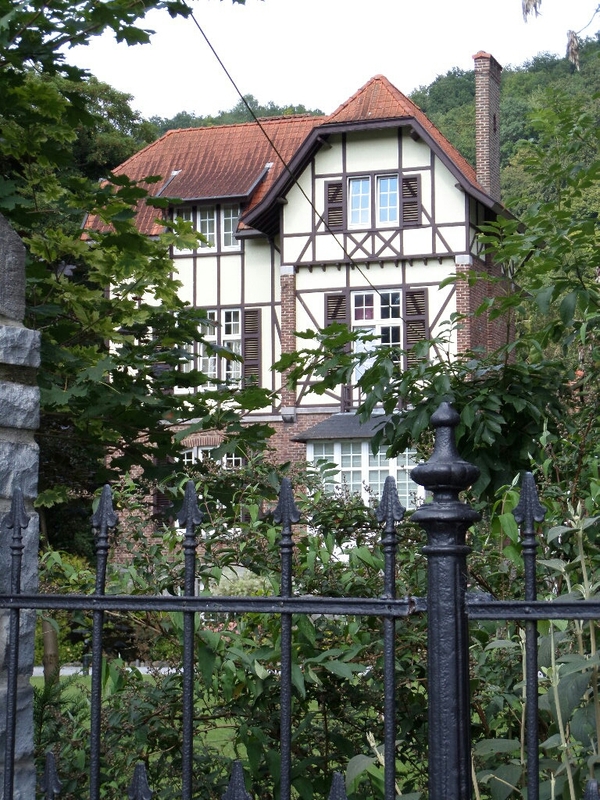 Just opposite the bar is this charming turret. 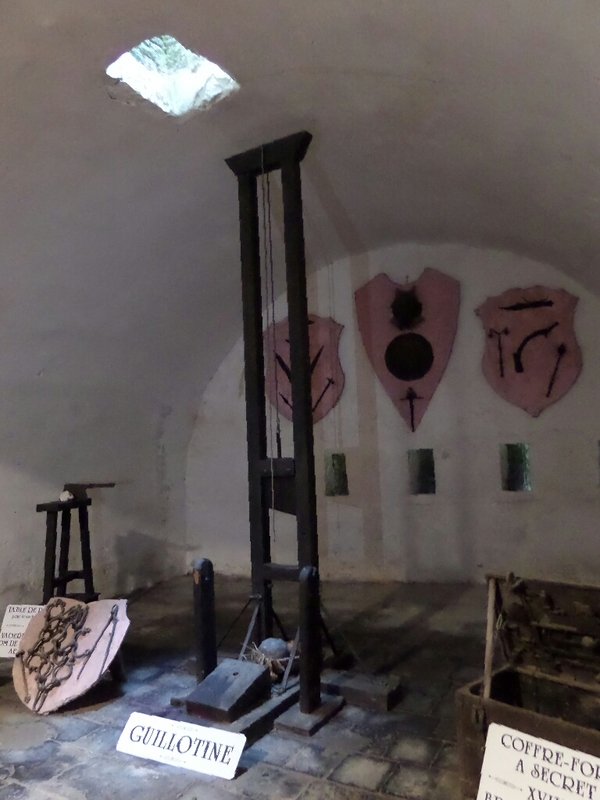 I’m not sure what it’s for but I swear I heard someone calling “Rapunzel, Rapunzel, let down your hair …”. It may have been my imagination! Today I awoke to the sound of rain which was a welcome relief from the beautiful but tiring sunshine. After walking the dogs I decided to explore except there wasn’t really very much to see. Behind the lovely waterfront the town consists of little roads with a confusion of small shops and houses all vying for position. Very charming but nothing really to get your teeth into. There is a castle but I didn’t invest the energy I’m afraid. I hate leaving it out for all to see but needs must. 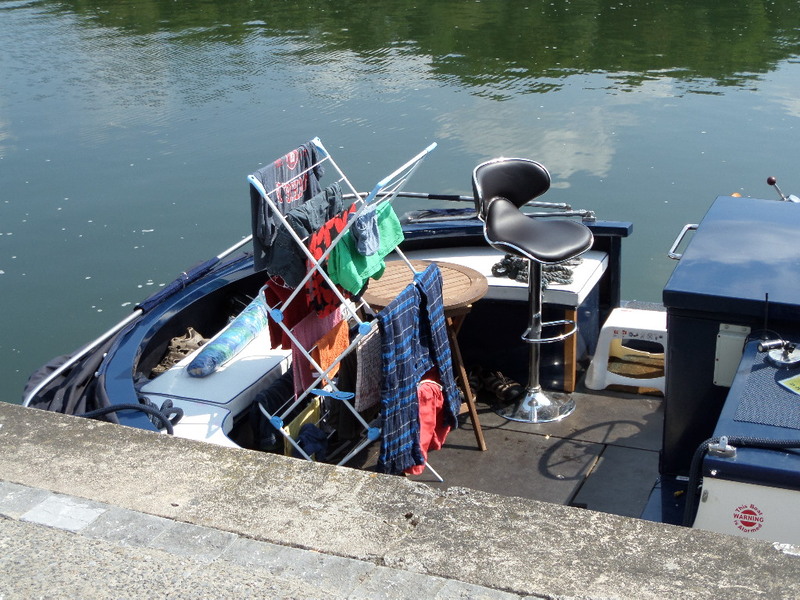 One day I’ll return to find half the washing missing I’m sure! We decided to stay put when we were told there was to be a festival. Kev did boaty stuff and I cooked a mammoth fry up for lunch. I lolled about catching up on my book club reading until late afternoon when I decided to explore the town. 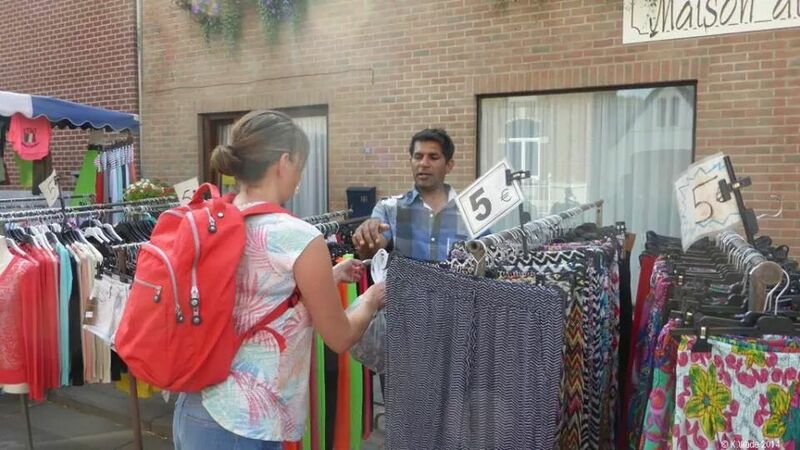 There was a market in full swing, a band playing and lots of people about. I bought a hugely expensive pineapple (€5!) and some cotton trousers for chilling in again €5! We stopped at a bar for a customary beer and were soon part of the celebrations. The folding bikes caused a lot of curiosity too. 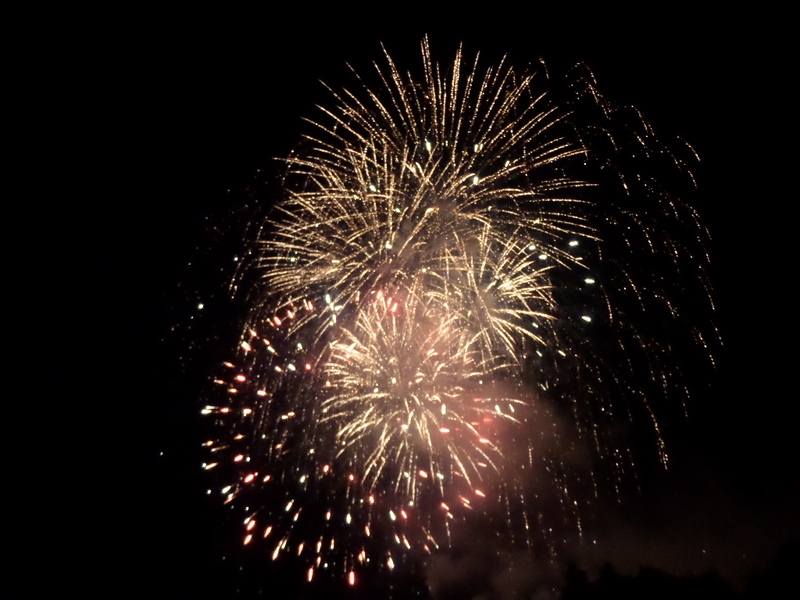 At around 11.30 the fireworks started. I stayed with the dogs in case they freaked out but Kev went to see and took my camera. 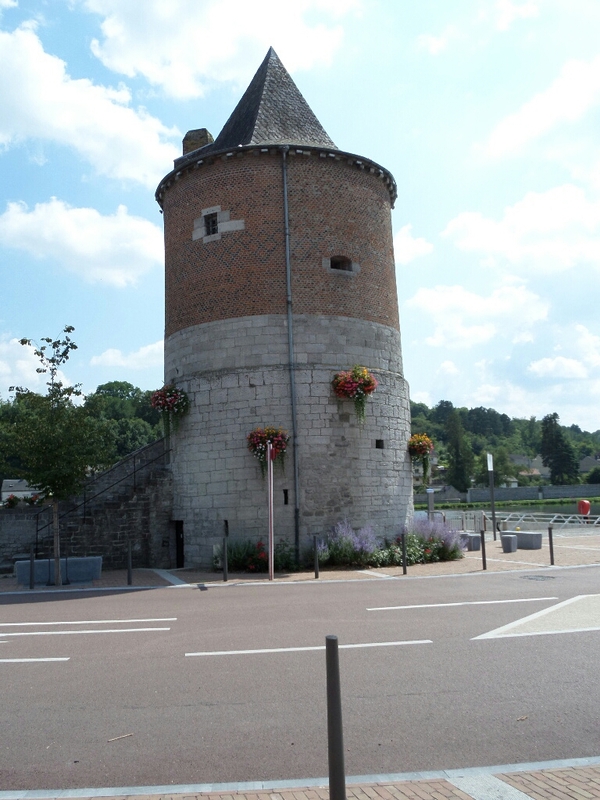 Today we are definitely on our way to Givet. 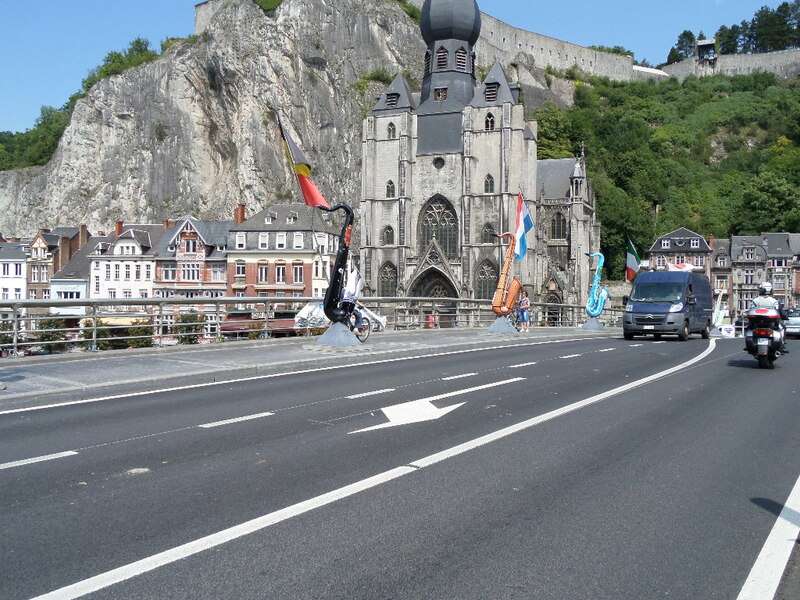 Yesterday it was time to leave Dinant and head towards Givet. Another stunning day and with beautiful scenery the day couldn’t have been more perfect. I’m finding the locks easier now and today we used the hooks we had made to make tying off easier. They worked! Check out http://www.wbavalon.blogspot.com to see them. 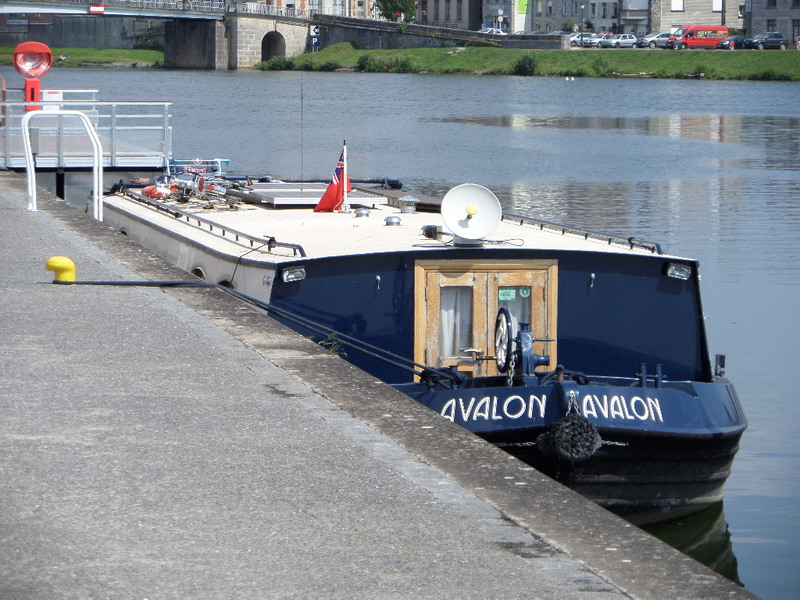 We moored in Hasteire for the night and intend to move to Givet later today. As I couldn’t post with all the photos I wanted here’s the rest of them! 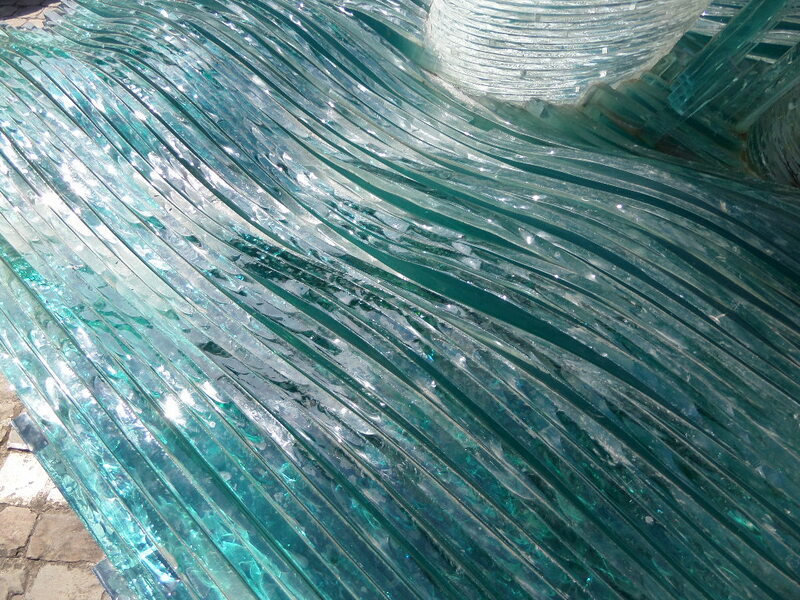 Close up of the glass saxophone sculpture. 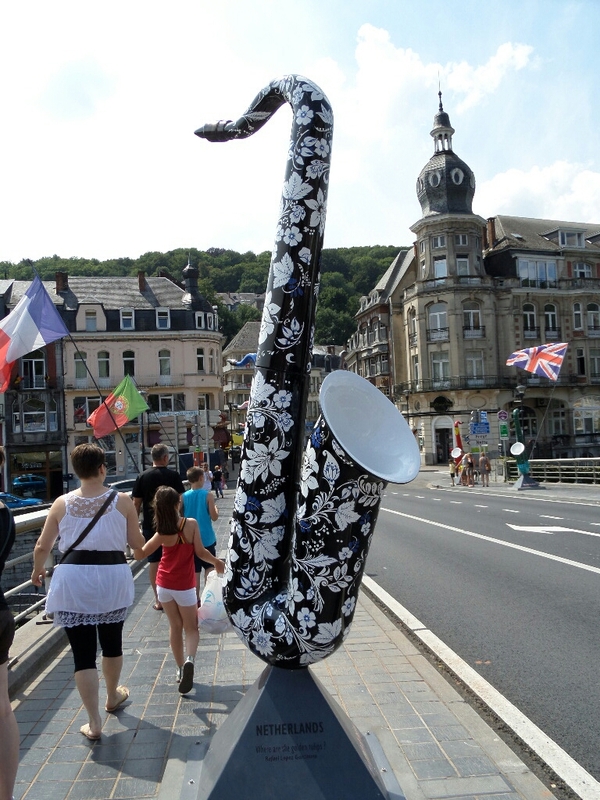 The bridge with its saxophones … Some are adopted by different countries. 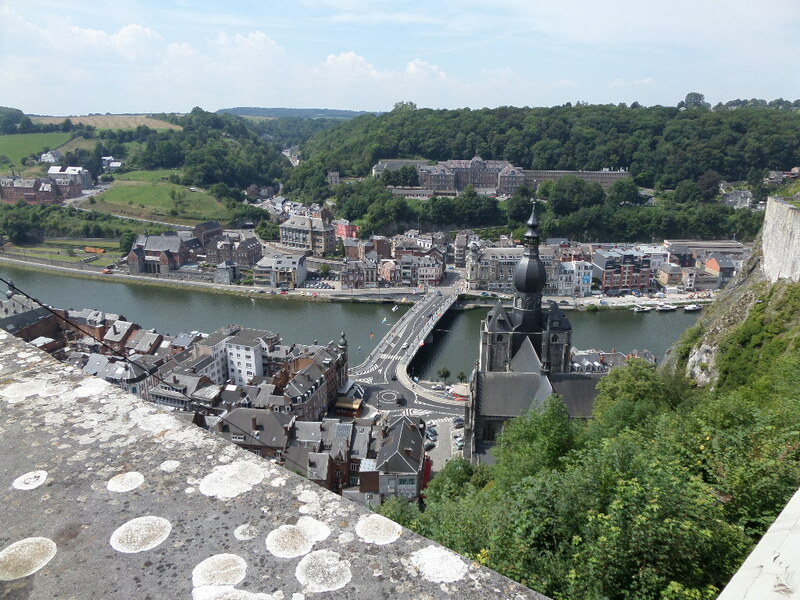 The view from the castle. 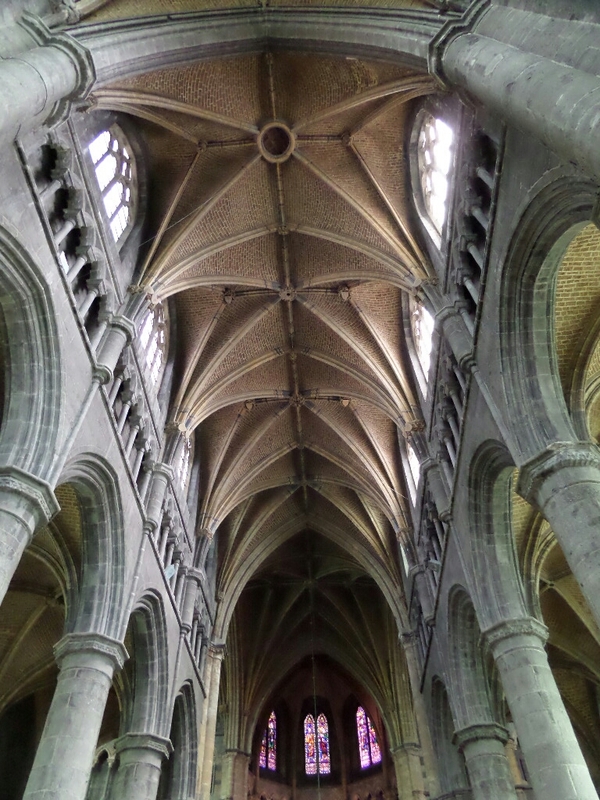 The ceiling of the church. 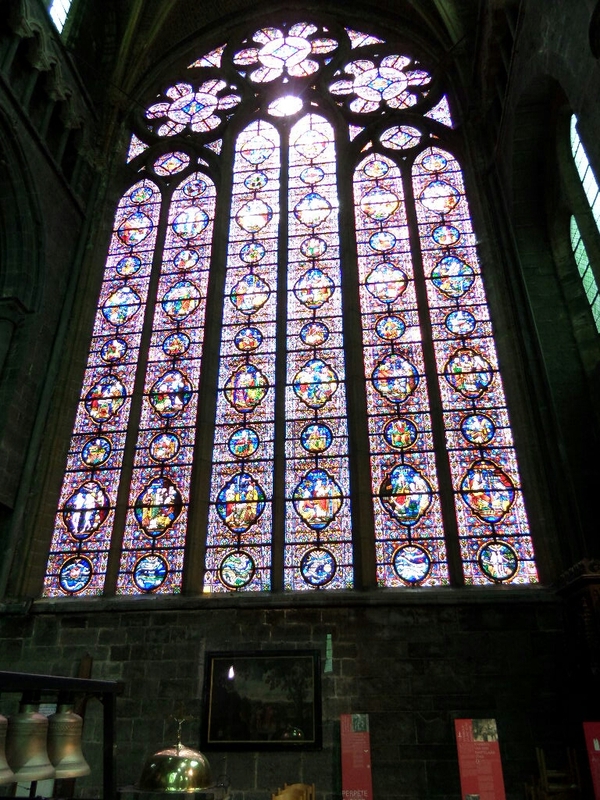 One of the magnificent stained glass windows. 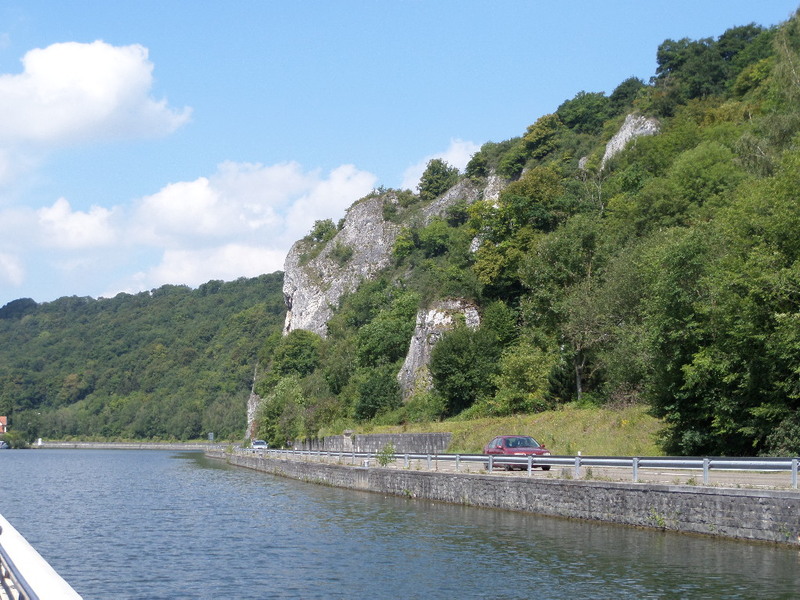 We left Yvoir yesterday morning to go to Dinant. The sun was shining brilliantly and the breeze Avalon created was very welcome! Too hot to drink regular coffee I made some iced coffee … It was delicious! There were 2 locks to tackle and boy were we both rusty! Still, no major hiccups and we survived intact. 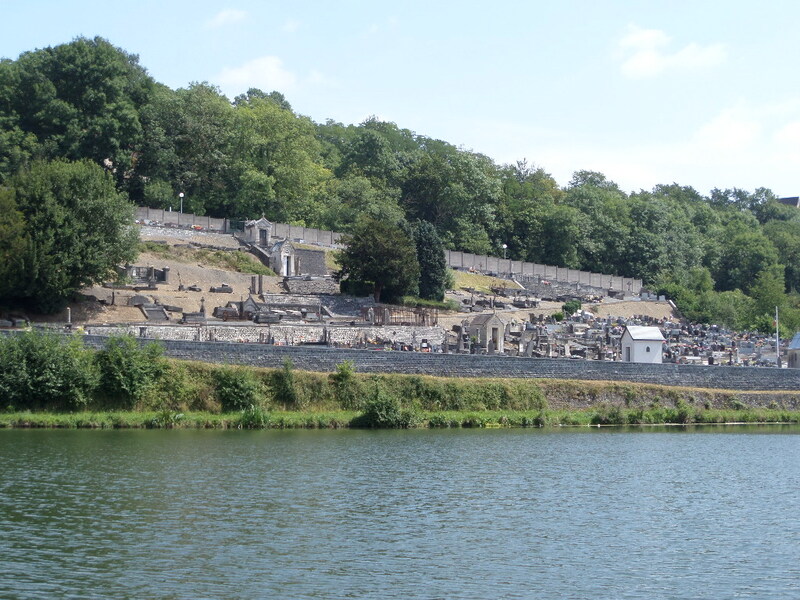 Arriving in Dinant we cruised past the official moorings which were full, and moored up nearby but a little further out. Then of course walked the dogs to stretch their legs. Today we decided to explore and headed into the centre mid morning. 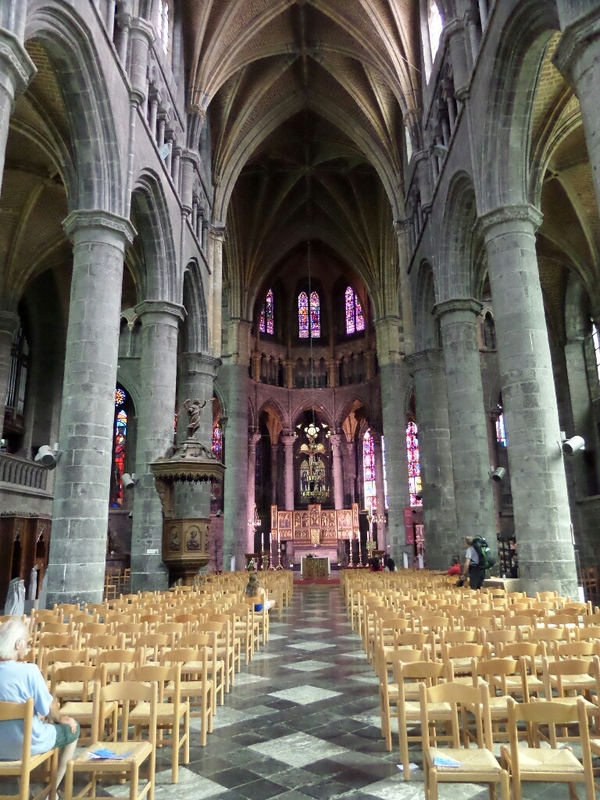 First stop was the Gothic church. I do love an old church … They smell wonderful! 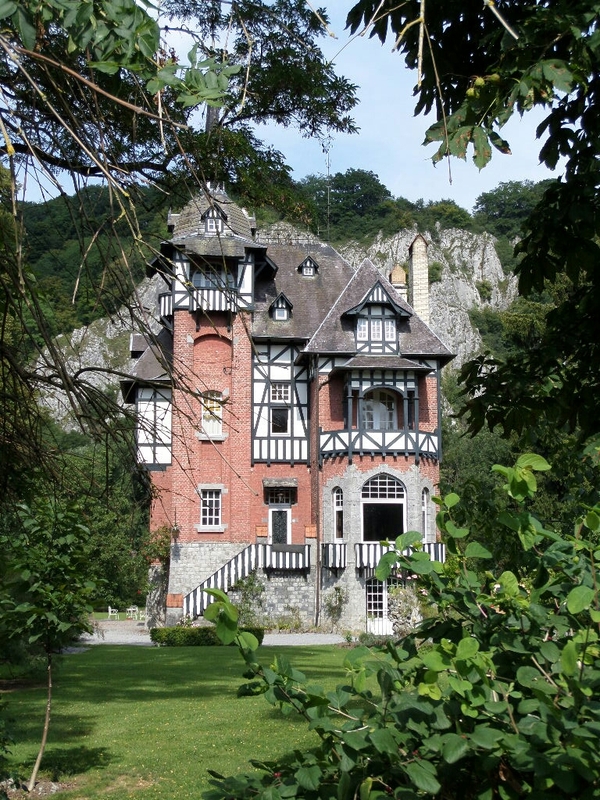 Next stop was the castle which involved a cable car ride. I shut my eyes and survived! We tagged along behind an organised tour and had an interesting time until we reached a section that had subsided during I think WW1. Oh boy! The whole structure was at a weird angle and it was difficult to stand straight and walk .. especially for me with my balance issues. I survived but they were very lucky that I wasn’t sick. There were some interesting scenes inside. This one caught my eye. I was shocked to see flick knives and reproduction guns for sale in the gift shop. 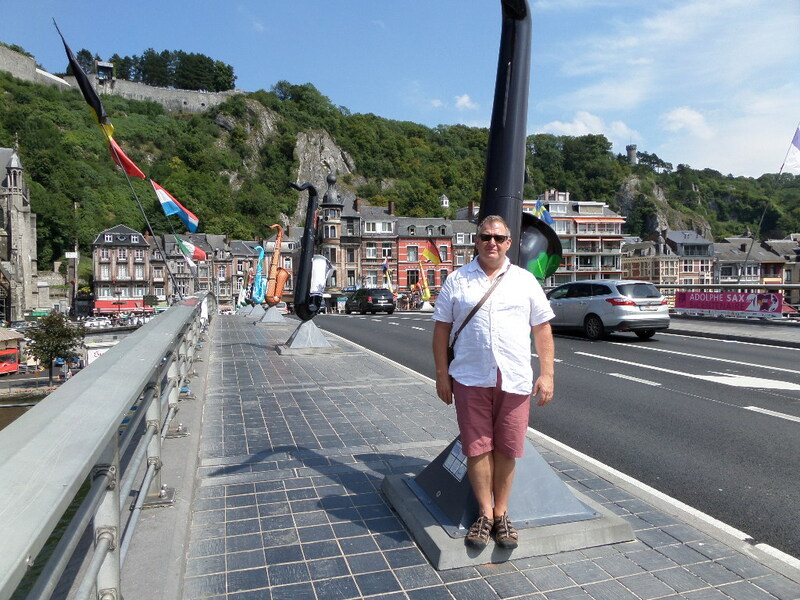 After a very agreeable lunch we visited the bridge which is famous for all its saxophone statues. 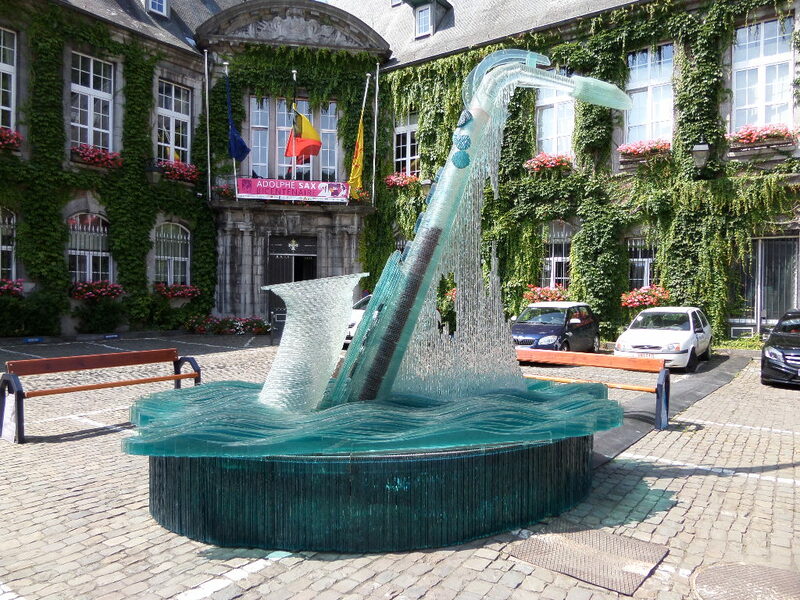 Walking through the town going back to the boat I discovered the saxophone museum which had this wonderful glass statue gracing it’s garden. 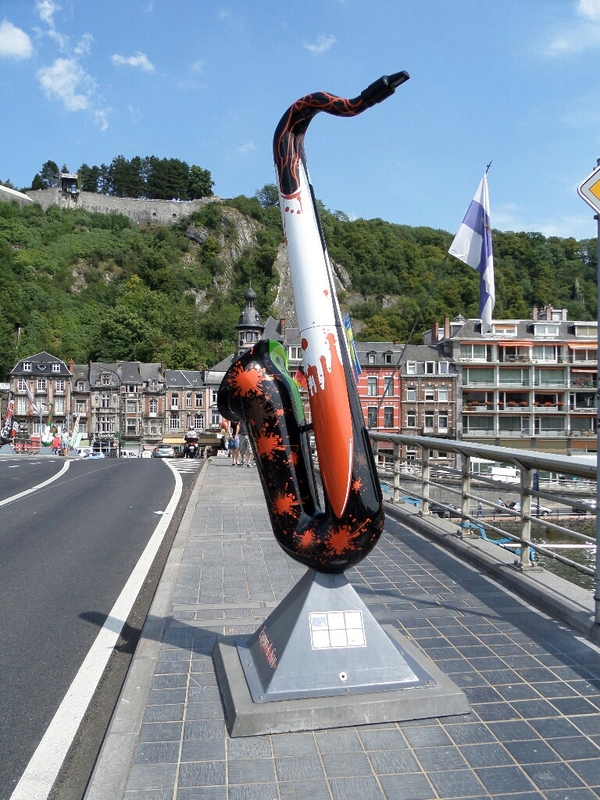 I should explain that Dinant is the home of the saxophone with its inventor, Adolphe Sax, living there in the 1800s. 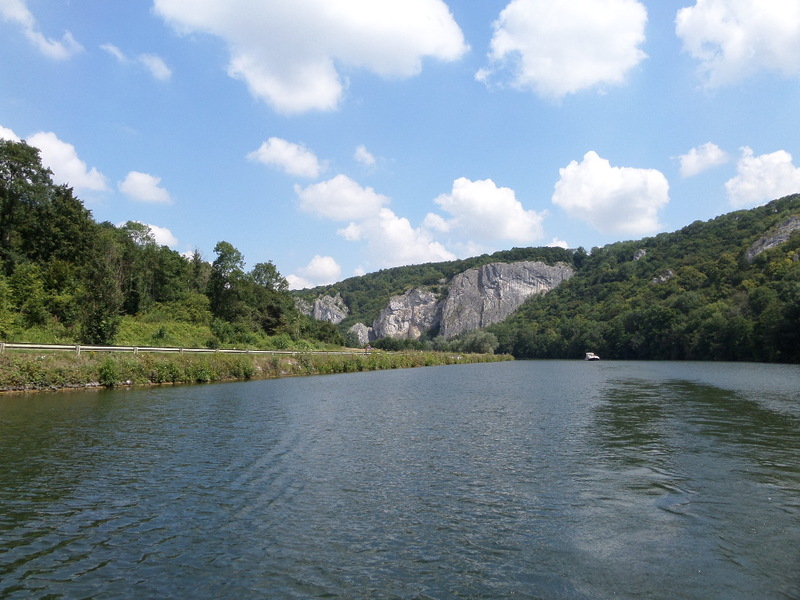 After one month in England to catch up with friends and family, yesterday we came back to Avalon in Yvoir. The day started early … too early as Kevin had got the ferry times wrong (rolls eyes). We had parked up in Dover so no long drive beforehand and the ferry trip was uneventful, nay boring. We were both shattered, having been up since 4 am so we drove about 60 miles before pulling into an aire to walk Teddy and Herbie and have a quick kip. After an hour we were both wide awake and eager to get to the boat. Once on board there was lots to do … unpacking, unpacking and more unpacking. Not just clothes but also food, my bike and various other bits and bobs. The weather is extremely hot here so it was pretty tiring but finally I could sink back into the sofa with a glass of wine for a chill. Today has been spent pottering about getting things ready and giving the dogs some much needed exercise. 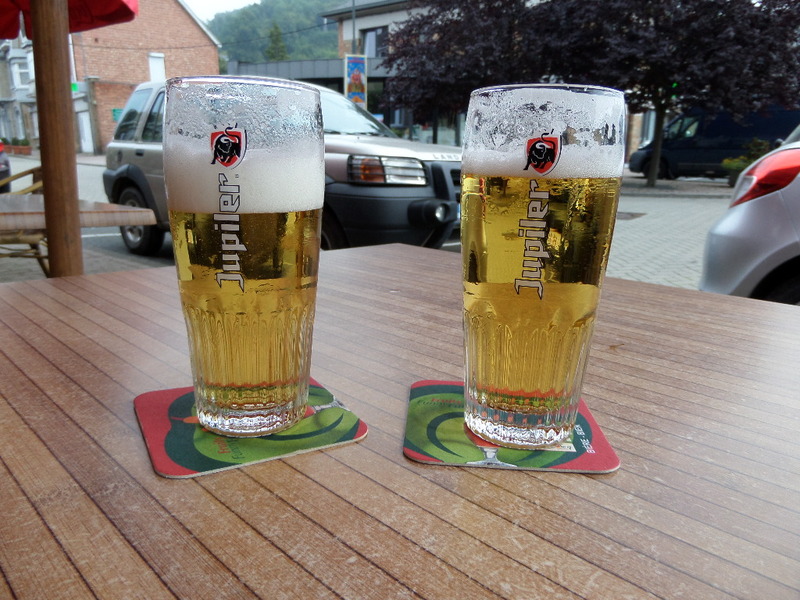 A nice walk into the village centre demanded a short rest at a local bar, just to watch the world go by and chat to a few locals you understand. 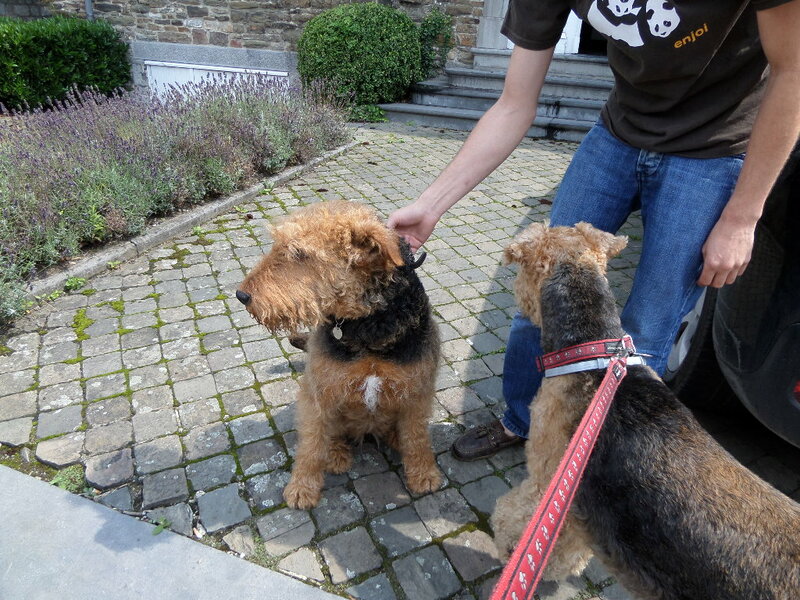 On the way back I met another Airedale, there does seem to be a few around Belgium. Teddy liked the look of her! I admit I’m rather envious! 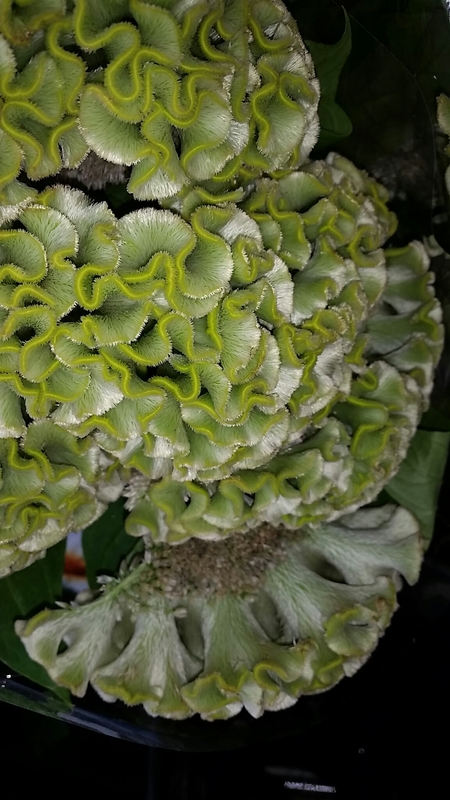 Now, have you ever seen a flower like this? Spotted in the local supermarket. Furry AND frilly! Very odd. 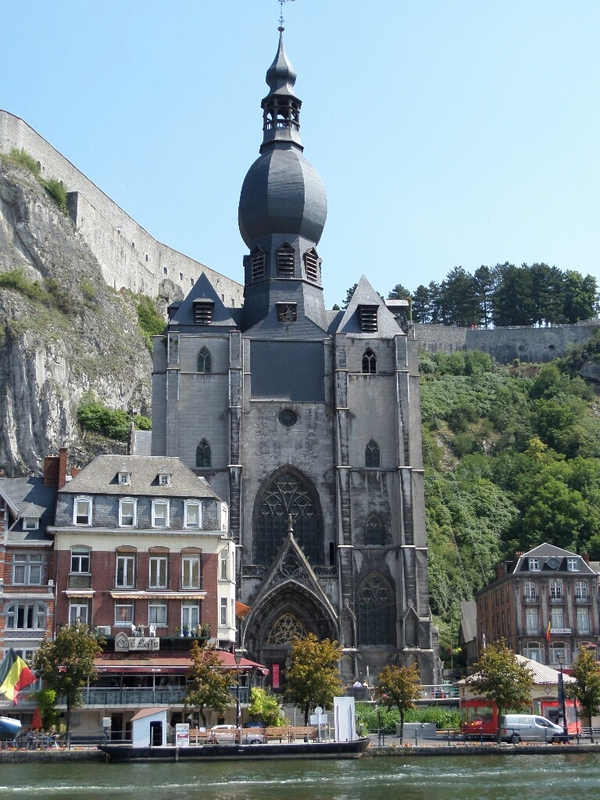 Tomorrow we are heading to Dinant which I have been told is rather lovely!